Well planned and constructed crossings prevent damage to the stream bed and reduce the amount of sediment, nutrients and bacteria getting into waterways. They may also improve stock health and production by reducing stress, lameness and the potential of liver fluke. 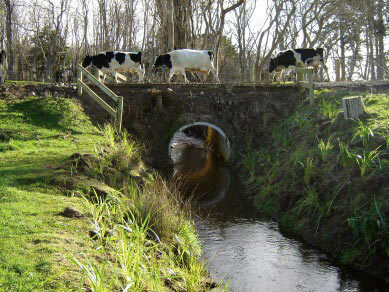 The Sustainable Dairying Water Accord requires all farms to have bridges or culverts (constructed crossings) on regular stock crossing points by 31 May 2018. Regular crossing points are considered those used more than once a month to access the milking shed. Consult with your regional council to find out what their rules are around constructing crossings. If a proposed crossing is on a waterway managed by the regional council for flood protection purposes, restrictions may apply. What to build: culvert or bridge? The type of crossing constructed is dependent on waterway size and shape, high flow levels and the types of vehicles that need to cross. Ideally a crossing point should be at a narrow point of the waterway, with flat approaches on either side or approaches that slope away from the waterway. Avoid locating crossings where there are steep slopes leading down to it. Flat or slightly rising approaches are safer for farm vehicles, reduce the risk of stock slipping and reduce sediment and nutrient runoff into the waterway. Choose a straight stretch of stream with a low gradient (bends in the stream near culverts are more likely to cause erosion). Crossings should be constructed so that storm water runoff from the track leading to and from the crossing can be diverted away from the stream (using earth cut-off drains) into a grassy area. Raised edges (often called nib walls) on the crossing will help prevent direct runoff from entering the water. Where suitable: Waterway less 2m wide. Average rainfall less than 1800mm. Can accommodate the full width of a small stream and some of the natural bank. Avoid using culverts less than 300mm in diameter. Avoid installing the outlet above stream level, which will create a waterfall. Where suitable: Waterway less than 2m wide. Average rainfall less than 1800mm. 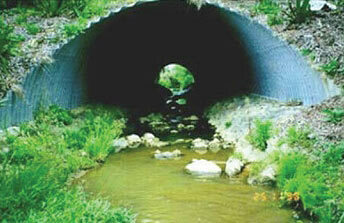 Ensure a good size culvert is installed to allow for the full width of the stream. Avoid constricting the stream width which will increase water velocities. Avoid installing outlet above stream level, creating a waterfall. 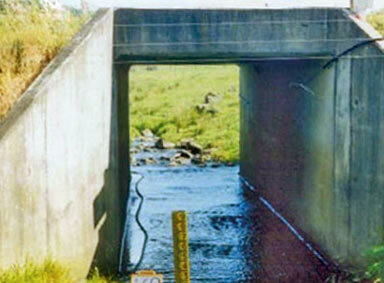 Box culverts often accommodate the full width of a waterway. Install on a slight angle to allow for fish passage in low flows. 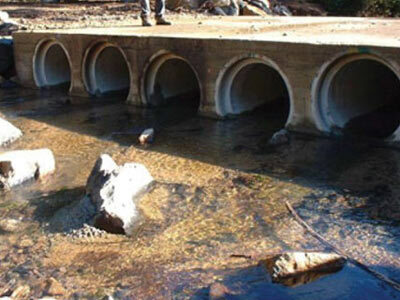 Avoid installing horizontally which spreads the water across the bottom of the culvert, restricting fish movement. Avoid using culverts less than 300mm in diameter. Avoid installing outlet above stream level which will create a waterfall. Where suitable: Dependent on the catchment area, but can be used in a higher rainfall area or larger catchment than a single barrel culvert of the same size. 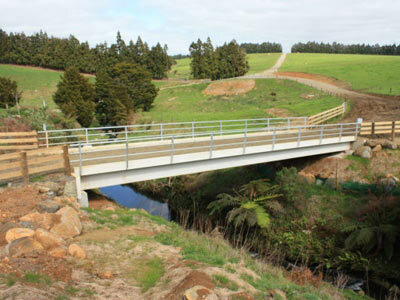 Used to accommodate larger flows, and can be a far cheaper option than installing bridges across large waterways. 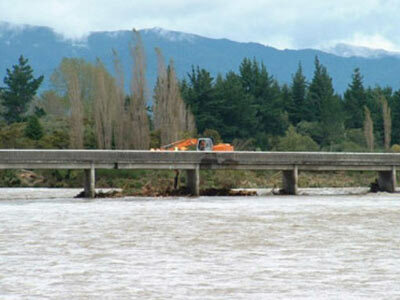 However they will collect more debris than bridges and require more maintenance. Avoid having all the culverts at the same height. Ensure that low flow and high flow events are covered. Avoid installing outlet above stream level which will create a waterfall. Where suitable: Good for streams less than 10m wide and will be suitable for larger streams in many cases. 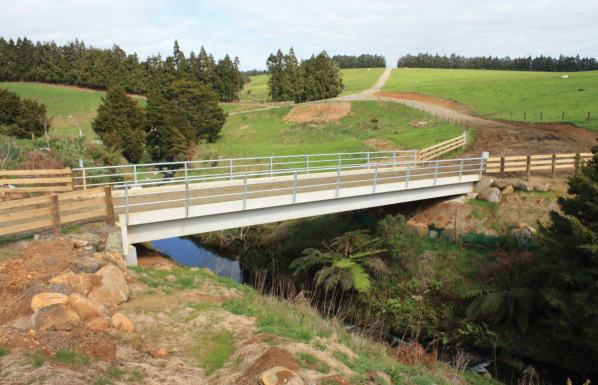 Single span bridges provide a long term option when constructed well with quality materials. Engineering advice is usually required. Consent is almost always required. Avoid using recycled material such as car bodies or trailer parts. Avoid installing bridge in the flow path of flood events. Not common on farms and expert advice is absolutely required. Avoid taking on this scale of project alone. Ensure resource consent is sought and engineers are involved.